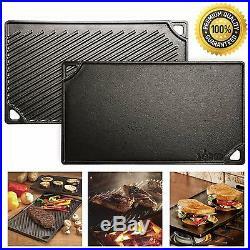 NEW Reversible Cast Iron Grill Griddle Pan Hamburger Steak Stove Top Fry Burner. 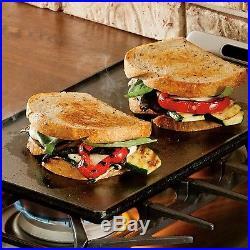 About the Product: What could be better than a reversible griddle? The smooth side is great for making grilled cheese sandwiches as well as eggs, pancakes and french toast. 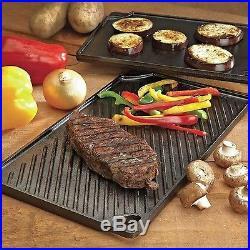 The ribbed side is perfect for grilling foods such as steak, fish, chicken and hamburgers. 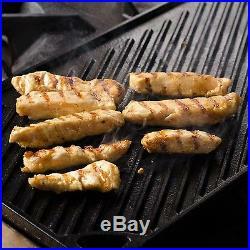 The food sits above the grease making your cooking experience much healthier. Seasoned and ready to use. 16-3/16″ x 9-7/16″ x 1/2 The following use and care instructions for Lodge Seasoned Cast Iron will help your cookware last a lifetime. If you do Nothing Else… Dry immediatelyeven before first use. Rub with a light coat of vegetable oil after every wash. Enough to restore the sheen, without being sticky. To keep the iron seasoned and protected from moisture. SeasoningIt isn’t Salt and Pepper Seasoning is vegetable oil baked onto the iron at a high temperature: not a chemical non-stick coating. Seasoning creates the natural, easy-release properties. The more you cook, the better it gets. Because you create, maintain, and even repair the seasoning, your cookware can last 100 years or more. 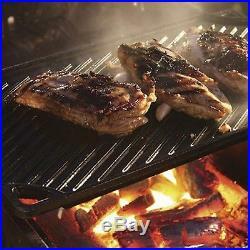 Chemical non-stick coating cannot be repaired, limiting lifespan. Lodge Cast Iron is right at home on induction, ceramic, electric and gas cooktops, in your oven, on the grill, or even over the campfire. Do not use in the microwave. On glass or ceramic cooktops, lift cookware; never slide it. Our cookware is safe at high temperatures; use metal, wood, or hi-temp silicone utensils. Some foods may stick to new cookware (especially eggs). Use a little extra oil or butter until youve built up the seasoning. Acidic foods like tomatoes, beans, and certain sauces can damage seasoning, and should be avoided until the seasoning is well-established. Cast Iron rarely needs to go above a medium heat setting when properly pre-heated. For the times when you do cook at higher temperatures, bring the pan to temperature gradually and add oil to just before adding food to prevent sticking. Our handles get hot; use mitts. Use trivets to protect countertops from hot cookware. To Soap or not to Soap… If no soap is too scary, wash with mild soapy water and dry and oil immediately. However, consider that cookware is 400ºF in 4 minutes on medium heat and is sterile at 212º F, so soap isnt always necessary. Dishwashers, strong detergents and metal scouring pads are not recommended, as they remove seasoning. Don’t Panic, it’s not Broken Without protective seasoning iron can rust. Its really easy to fix. Scour the rust, rinse, dry, and rub with a little vegetable oil. If problem persists, you will need to thoroughly remove all rust and follow our re-seasoning instructions (below). Refurbish Your Finish While maintaining the seasoning should keep your Cast Iron and Carbon Steel in good condition, at some point you may need to re-season your cookware. If food sticks to the surface, or you notice a dull, gray color, repeat the seasoning process: Wash the cookware with hot, soapy water and a stiff brush. (It is okay to use soap this time because you are preparing to re-season the cookware). Rinse and dry completely. Apply a very thin, even coating of MELTED solid vegetable shortening (or cooking oil of your choice) to the cookware inside and out. Too much oil will result in a sticky finish. Place aluminum foil on the bottom rack of the oven (not directly on bottom) to catch any drips. Set oven temperature to 350 400 degrees F. Place cookware upside down on the top rack of the oven to prevent pooling. Bake the cookware for at least one hour. After the hour, turn the oven off and let the cookware cool in the oven. Store the cookware uncovered, in a dry place when cooled. Check out this helpful video too. Some Basics Gas flames should not extend up the sides of cookware. Match pan size to burner size. Dont use in the microwave. When deep frying, fill cookware only to 1/3 of capacity. Reversible smooth and ribbed sides. 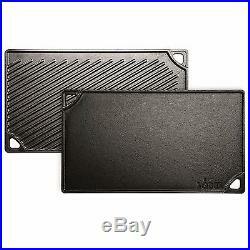 Cast iron for superior heat retention and versatility. 16-3/4 x 9-1/2 x 1/2 Inch. APO/FPOs are definitely excluded. PO Boxes: Please include a physical street address. Your order will be delayed if a physical address is not provided. We will make sure to resolve your issue quickly. We promise we can make you happy if you give us a fair chance. The item “NEW Reversible Cast Iron Grill Griddle Pan Hamburger Steak Stove Top Fry Burner” is in sale since Friday, March 11, 2016. 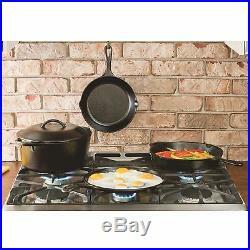 This item is in the category “Home & Garden\Kitchen, Dining & Bar\Small Kitchen Appliances\Grills & Griddles”. The seller is “cutting-edge-retailer” and is located in Multiple Locations. This item can be shipped to United States.